The Bills would like to keep all of their unrestricted free agents, but some might be easier to return to the fold than others. Such might prove to be the case with S Da’Norris Searcy. Searcy is coming off a very successful season as he assumed a starting safety role opposite Aaron Williams and was very productive. But if Searcy is looking to cash in big time on his second contract, like most NFL players, it could prove too steep for the Bills to handle. Fortunately for the Bills if they can’t come to an agreement with Searcy they have depth at the position with Duke Williams, Baccari Rambo and Jonathan Meeks still on the roster. “If he does move on we think we’ve got three guys that will compete and one of those guys is going to come out of there as the starter, but we have two excellent backups,” said Whaley. On locker clean out day Searcy said as much as he’d like to return he has to put the needs of his family first. We’ll see how things pan out soon enough with free agency set to open in just over a couple of weeks. Da’Norris Searcy did not participate in practice on Wednesday, but was able to do a little more in practice Thursday as he worked on a limited basis. Searcy is dealing with a hamstring injury. Mario Williams and Chris Hairston returned to practice Thursday from illness. This year BOSE, the Official Sound of the Bills, is going to bring insider access to fans by showing fans what songs Bills players listen to on game day. 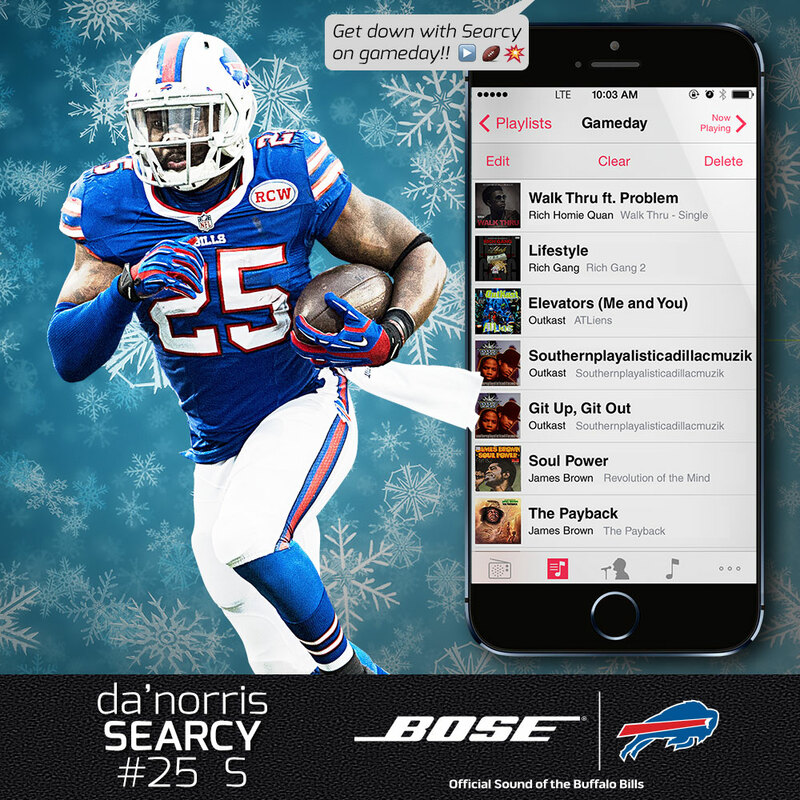 For 12 weeks during the 2014 season, a different Bills player will be featured in the Player Playlist, presented by BOSE. For this week, it’s Bills S Da’Norris Searcy. Check out the songs Da’Norris will be listening to on Sunday to get him pumped up before he takes on the Broncos. Now standing in second on the team in interceptions, it hasn’t just been his plays on the ball that have made Da’Norris Searcy a valuable part of Buffalo’s defense. His two picks Sunday however, were welcomed by his head coach. Searcy (3 INTs) only trails Leodis McKelvin (4 INTs) for the team lead in interceptions and McKelvin is done for the year with a fractured ankle. At halftime the Bills were down only 3-0 thanks in large part to a defensive effort that kept scoring opportunities for the Browns to a minimum. Head coach Doug Marrone appealed to his players to rally for the fans in the second half and the team delivered. Now at 7-5 the Bills are still in the playoff hunt in the AFC with four games to play. “It’s great. In the end, we’re still in the hunt, so it was a good win,” said Searcy. Ron Brooks was not a full participant, but that fact that he was cleared to participate on a limited basis just three days removed from a scary neck injury on the field in Week 5 against the Lions that required a trip to the hospital and an overnight stay in Detroit, the Bills are relieved to see him on his feet. Other players who were nicked up in last Sunday’s game were also limited participants in practice. Here’s a list of them below. Bills head coach Doug Marrone addressed his situation at safety this week with Da’Norris Searcy trying to return from an ankle injury suffered last week. There’s a chance Corey Graham could see some time at safety along with Duke Williams, but Marrone is encouraged by the progress Searcy has made in practice through the course of the week. He’s entering his fourth NFL season, but Da’Norris Searcy has never been a full-time starter. That will change in 2014 as he earned the starting strong safety role as he’ll be paired with fellow draft classmate Aaron Williams (2011). Searcy, who has 10 career starts under his belt already, feels ready to be a full-time contributor. Searcy was in a competition with Jonathan Meeks and Duke Williams for the role all offseason. Now that he has the job he’s focused on taking things as they come this season. The Bills defense was top three in interceptions last season and top two in takeaways. On Friday night Buffalo’s defenders despite undertaking a new scheme showed they’re ready to pick up where they left off in 2013. Searcy’s pick came on a cover two look by Buffalo’s defense with Carolina QB Matt Blanchard simply overthrowing his intended target. Manny Lawson had the first takeaway. After Jarius Wynn forced a quarterback fumble, Lawson lunged onto the ball for the recovery at the Carolina 28. A touchdown soon followed. Jonathan Meeks closed out the turnover tally with an interception in the waning moments of the game to preserve the team’s two-point lead for the win. Robert Woods and Da’Norris Searcy got into a scrap after the play in 11-on-11. There was jawing first then punched flew before they wrestled each other to the ground. Tempers flaring here late in practice on a hot day. Well Bills fans it’s here. The 2014 Bills training camp presented by Connors and Ferris gets underway with player report day today. I will do my best to keep up to date on Fan Fridays during camp knowing that’s when questions will be flying in from you folks. It just gets a bit nutty sometimes at camp so bear with me. Send your questions as always to me on email at AskChris@bills.nfl.net and on Twitter @ChrisBrownBills. I Love all the work that you do. As far as the current Bills go I had a question about the plays EJ was requesting to be removed from the offence. I remember that he wanted ‘clean reads’. I don’t know much about professional play structure, but I wanted to ask if, by eliminating those, does that make it easier for the defense to adjust to the play, or, more generally, how does doing that affect the defense. Are they clean reads versus the Tampa 2, but maybe not 3-deep, etc.? CB: I appreciate the compliment. I’ll let EJ explain what he was getting at with respect to the give and take with offensive coordinator Nathaniel Hackett on choosing plays to keep or remove from the game plan week to week. Having “clean reads” could mean a number of different things so we’d only be speculating as to what EJ meant exactly. In reality taking plays out doesn’t make it easier for the defense. They still will likely not know what’s coming next. And as Manuel said very shortly after making this comment, you could have just 20 plays in a game plan and if you execute them effectively it doesn’t matter what the defense does. That was the M.O. of the K-gun offense. Fast, simple, effective. It wouldn’t surprise me if the current Bills try to adopt a bit of that philosophy this season. Not the same offense, but the same approach. My question is about the general experiences that a fan from Charleston, South Carolina needs to experience (born and raised in Damascus, VA- a very small town but now, I live and have worked in SC for 7 yrs). I have been a fan since I was a kid and one of my dreams is now coming true. My wonderful wife bought me tickets for the Minnesota game and being so far away from Western New York of course this will be my first game. I was wondering if there are places to possibly get autographs from the team? I do have many questions but I will keep it brief; could you tell me the name of the wing place that they take the first round draft pics at? Any information would be greatly appreciated you do a great job at keeping us non-local fans informed. CB: Autographs are easiest to obtain at training camp with the next best option being by good old fashioned mail. If you’ve got an item you want signed that can be mailed I’d recommend it. Just send it to the player’s attention at One Bills Drive, Orchard Park, NY 14127 with a self-addressed envelope so he can send whatever he signs back to you. As for experiences here on game weekend Duff’s is the place to go for wings, but you’ll be able to get them right at the stadium this season at most of the concession stands. They’re the official wing of the Buffalo Bills. The brand new Bills store will be up and running so that will be a stop you have to make. We also have the Bills Experience inside the team’s Fieldhouse on game day that is open to fans from 9:30 to 12:30 for 1 pm home games. A lot of interactive stuff is there for fans to do along with a host of vendors and you can watch the pre-game radio show on our flagship station live for the whole three hours. I’ll be there for the final hour myself so be sure to come say hello. Safe travels and we’ll see you up here on Oct. 19th! Looking forward to training camp and we always have a group which goes to a night practice. Is there any information available on where and when we can get tickets? This is the toughest part of the process as sometimes they are only in Rochester locations. Trying to make plans, so this would be a great help. Thanks so much. CB: Here is the link to all the information you’ll need on night practice tickets. Thanks for all of the great coverage of the Bills throughout the year. I was disappointed when I heard the news regarding Kiko; he was all over the field last year and the heart of the defense. However, I feel that Bradham and/or Rivers are capable of quality play at linebacker. Returning from a torn ACL is never easy, but do you think it is easier for defensive player to return to their pre-injury form after recovery compared to offensive players? I just hope Kiko will be able to go sideline to sideline in the 2015 season like he did during the 2013 campaign. CB: I don’t know if it’s any easier for a defensive player to return to pre-injury form than an offensive player. The reason a blanket statement like that can’t be used is because every ACL recovery case is different. Every person heals and recovers differently from the next. That’s largely why physicians put a 7-9 month recovery window on ACL reconstruction patients. Some heal faster and some heal slower, so a two month window on the recovery is given. Let’s hope Kiko is a quick and effective healer. First and foremost you’re the man. Your work ethic on providing up to date info on our squad is second to none. My first question is why is Aaron Williams being moved to FS? I would’ve loved to see him stay at SS with Corey Graham taking FS. I thought that’s why Graham was signed. Poor Williams has had 4 new DC. And 3 position changes now. Second has there been talk about slowing down the offense towards the end of games if we’re leading?? CB: Williams is being moved to free safety to replace Jairus Byrd. Coming from a coverage background at corner, he has the athleticism and experience to cover the deep half and roll over the top of his corners in double coverage situations. The way Jim Schwartz uses safeties makes the position designations of strong and free somewhat moot. They’re largely interchangeable in his scheme. Corey Graham will probably get a look at safety. How lengthy that look will be and how seriously he’s considered for a role at safety be it as a starter or reserve remains to be seen. Da’Norris Searcy enters training camp as the top guy at strong safety at this point. He’ll get healthy competition from Duke Williams and Jonathan Meeks. As for slowing down the offense. If the Bills have the lead late I do expect them to go into a four-minute mode more often especially with a pound out yards rusher like Anthony Dixon now on the roster. Whether they’ll slow down the tempo is likely going to be decided on a case by case basis. Baylor safety Ahmad Dixon is a big time hitter and spent some time with the Bills this weekend. Forecast as a fourth-round pick, Dixon confirmed he met with Buffalo for an interview. He was used in a couple of different roles for the Bears including a hybrid nickel linebacker-safety role not that different from the role played by Buffalo’s Da’Norris Searcy. He is active in run support and has decent coverage ability. Dixon is expected to run in the mid-4.5s Tuesday. The Baylor safety was ejected from the TCU game this past season for targeting and was suspended for the first half of the following game against Texas as a result. Dixon said he has not been asked about the ejection by any of the teams that interviewed him to this point. We already know that Stevie Johnson and Robert Woods are out for Sunday. Here’s how the rest of the injury report shapes up for the Bills with S Da’Norris Searcy the only remote concern. Searcy was only able to practice on a limited basis on Thursday and Friday, but is listed as probable and is expected to play. Bills safety Da’Norris Searcy missed Wednesday’s practice, but participated on a limited basis on Thursday leaving head coach Doug Marrone encouraged about Searcy’s availability for Sunday’s game. Here’s the Thursday updated injury report for the Bills. Bills head coach Doug Marrone said Wednesday that S Da’Norris Searcy was expected to practice on Thursday. That has proven to be the case. Searcy is dressed and participating in practice. Marrone indicated that it would likely be on a limited basis. Searcy’s hamstring stain suffered last week was considered minor. Not practicing are Stevie Johnson and Robert Woods. Bills LB Manny Lawson left Sunday’s game with what was reported to be a hamstring injury and did not return. But on Monday head coach Doug Marrone indicated that Lawson would be fine for this week’s game. When asked about Lawson’s injury status, Marrone stated succinctly that Lawson is good to go. “He’s good. No problems,” said Marrone. Having Lawson back in the lineup will be a big help to holding the edge against the run and on coverage assignments. He’s currently third on the team in tackles behind Kiko Alonso and Da’Norris Searcy.